Beyond preventing waste generation, Barcelona wants to build a model of consumption and development with the lowest possible ecological footprint and to move towards a circular economy. The milestone is to prevent waste as far as possible and for any refuse generated to be turned into quality raw material. Across Europe, a new study suggests that microplastics have been found in human waste. Over consumption of plastic and waste mismanagement is rapidly depleting the oceans and they are drowning with enormous amount of plastic and other waste materials that keeps getting deposited and humans are consuming them unknowingly. Microplastics have been found in tap water around the world, in the oceans and in flying insects. A recent investigation in Italy also found microplastics present in soft drinks. In birds, the ingestion of plastic has been found to remodel the tiny fingerlike projections inside the small intestine, disrupt iron absorption and add to stress on the liver. So we decided take up this plastic waste and turn it into something that contributes to the ecosystem to a certain extent. This project aims to collect waste with the help of a device that can act as a litter trap with a submersible water pump inside it which is capable of displacing water and just trapping waste. This device would be designed with membranes inside which catches different kinds of waste including the micro fibers. The collected plastic waste from the sea and the beach would then be shredded, compressed, melted and transformed at the beach itself into small interlocking blocks. These interlocking blocks would be placed in the sea by humans. 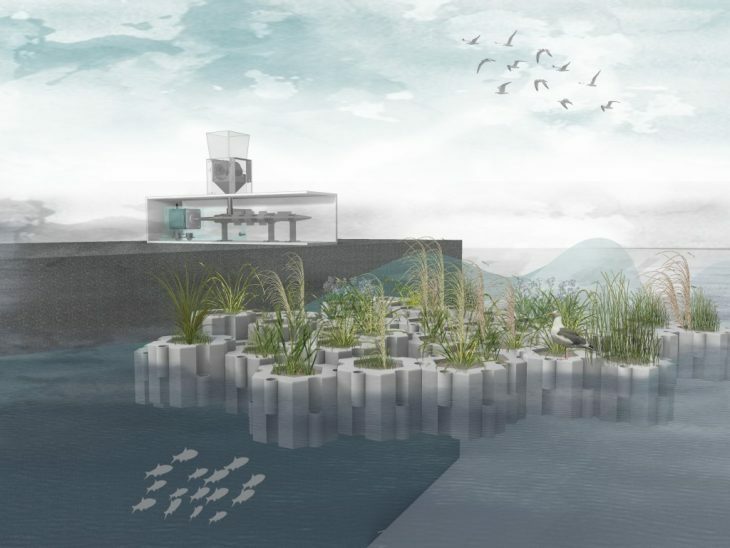 After a time period these blocks would become a floating platform capable of being filled with soil which would keep getting larger and would have the capability to grow plants for a new green environment which further aids in the birds’ migration and acts a shelter to marine life. At the bottom algae’s and different plants can attach, where fish and other marine life can safely put their eggs. The Seabin is a floating rubbish bin that can be located in the water at marinas, docks, ports and shores. The Seabin moves up and down with the range of tide collecting all floating rubbish. Water is sucked in from the surface and passes through a catch bag inside the Seabin, with a submersible water pump capable of displacing water. The water is then pumped back into the sea leaving litter and debris trapped in the catch bag to be disposed of properly. This device has been designed to shred the platic waste into small pieces with the help of rotating and fixed knives. The mesh at the bottom of the blades has been placed in order to only let the small pieces go through. The larger pieces would go back to the blades and it will keep shredding till the time it reaches the size small enough to go through the mesh. This device has been designed to melt the plastic that goes to the metal tube through the funnel, it gets heated there with the help of the nichrome wire wrapped around it, and in front of the device, there is an extruder which has the heater band for the plastic to get melted completely before it extrudes. This project aims to activate beach all day and an attempt make an environment friendly activity out of it. It is a way to try and stop the plastic waste at the beach and also collect plastic from the ocean and use that to create a product that is eco-friendly. This project will also promote awareness on simple but advanced technologies and can have a local impact on the communty. With this project we aim to create a small ecosystem suitable for the migrant birds as this island would become self sufficient after a certain period of time after it grows to a certain size that is able to provide a platform for them to rest and breed. As these interlocking bricks would have soil filled in them, plants suitable for the birds that would act as one part of the attraction for them. Such plants would be grown on these and once the birds start resting on this island, their feces would act as a fertilizer and help in the further growth of plants. This island would provide a shelter to the marine life as the roots of the plants coming down to the water would provide a place to them to keep their eggs.